The first years of a child’s life are very important. 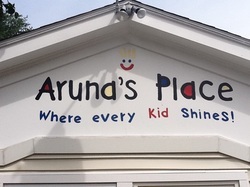 Aruna’s Place is a safe and nurturing environment where a lifetime love of learning begins. Our staff is committed to providing your child with a solid foundation. At Aruna’s Place, your child will learn and develop the educational, social and, most importantly, the life skills to prepare for them success in grade school and beyond. To accomplish this goal we have developed a curriculum where learning is fun and playful. We provide each child with age-appropriate, hands-on experiences to stimulate the imagination and learn the art of concentration. We teach the children to have self-control and respect for themselves and others. The children are encouraged to be problem-solvers and to learn from their mistakes. We are dedicated to one-on-one, individualized learning for each child. We have an open-door policy and encourage families and children to visit at any time. Our children “shine” through loving and caring about each other and themselves. Our staff considers it a privilege to work with your children to prepare them for success. Come by and visit! Our environment is a safe and secure place for children of all ages. At Aruna’s Place, we pride ourselves on having a long-term relationship with the children and their families. Graduates of Aruna’s Place often come back to visit and reminisce about old times, play and laugh with the students, or share their experiences by working as a teacher’s aid, furthering their own growth.